The fourth largest exporter of wine in the world, Australia produces a huge number of great reds and fine whites at its many vineyards. The vintages are mainly produced in the cooler parts of the country in New South Wales, South Australia, Victoria and Western Australia. 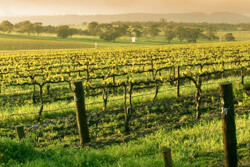 Perth, the Swan Valley and Margaret River are popular spots for winery tours in Australia. These organised excursions take in dozens of wineries, where visitors can taste many excellent varieties that rarely make it overseas. The routes also often include a look in on chocolate and cheese producers, whose wares make an excellent break from the succession of boozy tastings. It is best to organise transport before winery tours in Australia, as driving afterwards is strongly discouraged. In South Australia, the wine routes seem endless; the Barossa Valley, McLaren Vale, Clare Valley and Langhorne Creek are among the best known areas. Barossa Valley is one of the country’s oldest wine-growing regions, which makes it a great start for any winery tour in Australia. Just 35 miles to the northeast of Adelaide is where many of the country’s leading wine producers have headquarters or extensive holdings. The Alpine Valleys in Victoria, with their beautifully cool climate and excellent table wines, represent a lower-profile section of the country’s winery touring heartlands. Along with Barossa Valley, Hunter Valley in New South Wales was among the first of the country’s wine-producing areas, having planted vineyards in the mid-19th century. Famous grape varieties grown here include Chardonnay, Shiraz, Verdelho and Cabernet Sauvignon. Charter tours – minimum 10 people. Air conditioned coaches, wine tours, half day or full day, weddings. Venture Wine Tours Australia operate a wide variety of tours throughout Australia.